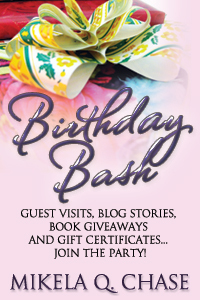 I’m over on Amber Kell’s Birthday Bash today – check it out and discover why August 9th is a bit special to me and my family! “We’re draining her magic.” Rafe kissed Rhea. Her magic rose to the surface and wrapped around the shifter. Rafe glowed for a minute before changing into a tiger. The beast snarled at Teven. “Don’t even think about it kitty,” Teven warned. Rhea sighed. Transforming the guards to their cat form always drained some of her power. She spun around to face the king. “Did you need something?” Rhea asked the king. “I see I can’t let you out of my sight.” Teven growled. Peller chuckled behind her. “You are just looking for trouble aren’t you,” he whispered. “Go guard my sister. 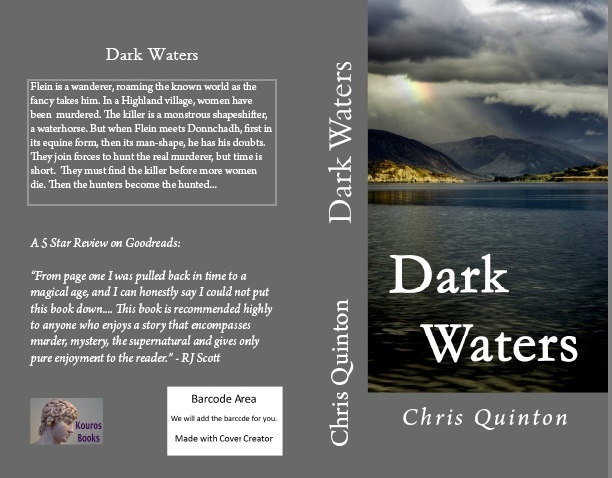 She’s wandering around here without protection,” Rhea reminded him. “That’s because we know you’re the trouble maker and need all the attention.” Peller teased. “Pfft, you two go I need to go so I can talk to the king.” Rhea made shooing motions with her hands. The king looked furious and she needed to smooth things over. She didn’t want her sister to have bad relations with her in-laws before she even got married. When the guards left Rhea closed the door behind them. “What is your problem now?” She crossed her arms over her chest as she confronted the king. “Hmm.” Rhea examined the king. She let him hold her and didn’t object when he kissed her. The man really knew how to kiss. She hummed at the warm flow pouring through her. Her magic settled to a low buzz instead of the roaring flame of before. 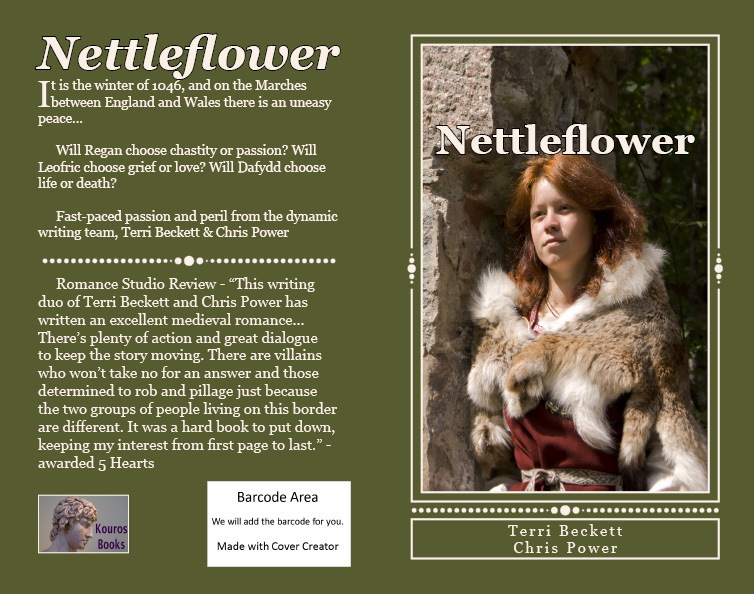 Teven slid his hands up and down her back in a soothing manner. “You belong to me,” Teven said. Slipping out of Teven’s arms she blew a kiss to the king before walking out the door. No way would she stay on this planet for the rest of her life. Five moons combined with her power was a recipe for disaster. “You can get away now but don’t think I’ve given up,” Teven called after her as she left the room. As she wandered the hall Rhea wondered what the dragon man wanted. Would he be back if she returned to the market? Curiosity had always been her downfall. Her father called it a bad trait but her mother called it fun. Of course mother was a bit unhinged. Deciding to take her chances, Rhea headed back toward the market. Of course she never got too far before two figures separated from the wall and flanked her on either side. “You two following me?” She asked raising her eyebrow. “Of course,” Rafe said back in his human form. “You’re riding the magic hard and you have impulse issues. Besides if your parents didn’t exile us for losing you, King Teven would tear us apart. Face it Rhea you’re stuck with us. Rhea sighed but secretly she appreciated her guards. Her shifters had protected her for years and she felt more comfortable confronting a dragon man with her guards. “Let’s go see a dragon about what he wants,” Rhea said. Go on a writing retreat, that is. 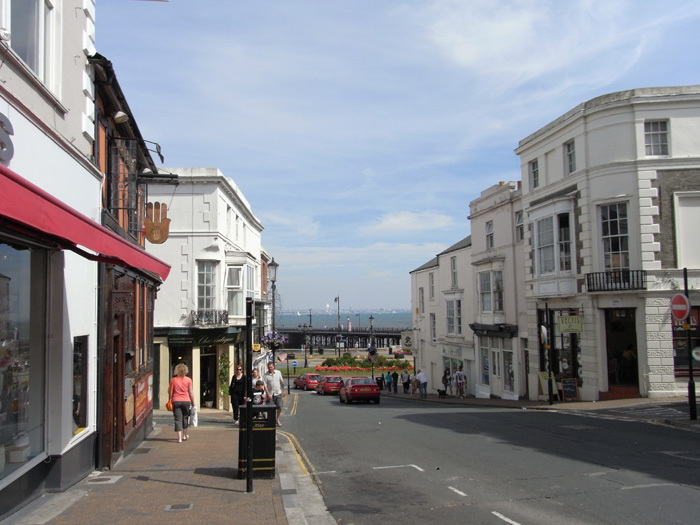 Which meant I packed a case and took myself and my laptop off to a B&B in Ryde on the Isle of Wight for five days, and it’s been great. I’ve broken my partial block, written more than I have in weeks [even if it isn’t as much as I’d’ve liked, and solved a couple of plot hangups. The weather has been kind to me [and the Olympics]. 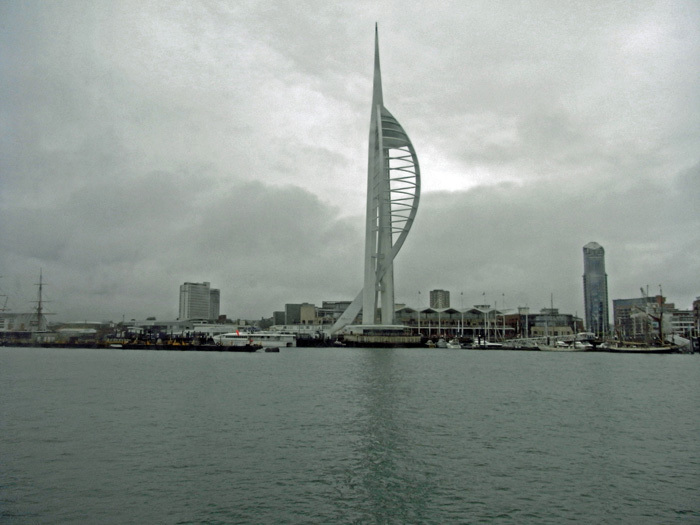 It was overcast when I left Portsmouth Harbour, and some of the photos I took through the windows of the catamaran-ferry make it seem even more gloomy. But all the time I was on the island, it was sunny and comfortably hot. Even yesterday, as I sat on the end of Ryde Pier awaiting the ferry back to Portsmouth, the sun was shining to put the lie to the weather forecast’s promise of rain all day. It hasn’t been slogging over a keyboard all the time. 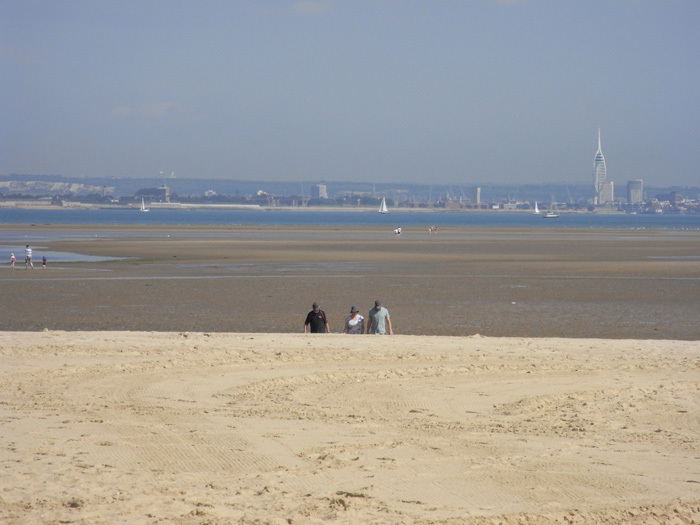 I did manage a wander along North Beach to give my feet their first – and probably last – dose of sea water this year, and explored Ryde itself. It’s a fascinating little town, with only one major supermarket right outside the town. There are lots of small local shops in the town itself, the like of which have disappeared from too many town centres in the UK. 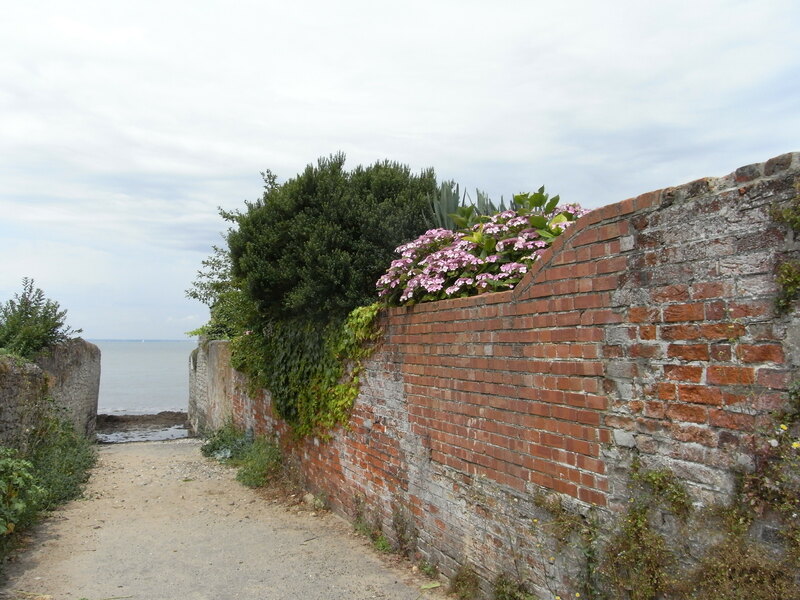 I also spent a lovely morning chatting with another writer-friend who lives not far from Ryde [lucky woman! *g*]. Seahaven House, my B&B, was literally just across the road and down a bit from the Pier. Two minutes walk once you reach the landward end of the Pier – which takes nearly ten minutes on foot. But there is a train that frequently runs the length of the Pier and on to Shanklin. My room at Seahaven was en suite, comfortable, with a desk-fan, a TV and free WiFi, and if I wasn’t on a low carb diet for my T2 Diabetes, the full English breakfasts would have piled on the pounds *g*. As it was, my eggs, bacon and mushrooms were delicious, even without the rest of the trimmings on offer. JD Wetherspoons have a pub on Union Street, also with free WiFi, so if I wasn’t writing in my room, I was there, beavering away. As well as JDW, there were other restaurants and cafes that offered basic salads at good prices, as well as pricier places to eat. 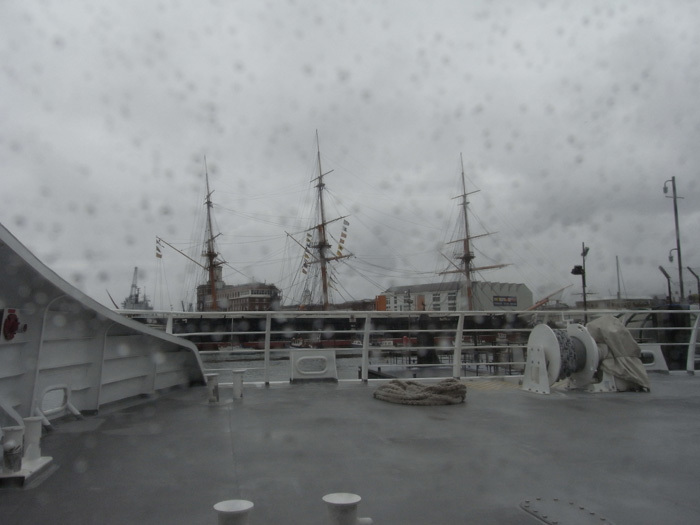 Once I was back in Portsmouth, and with nearly an hour to wait for my train home, I took the chance to take some photos of HMS Warrior while the sun was still cooperating. 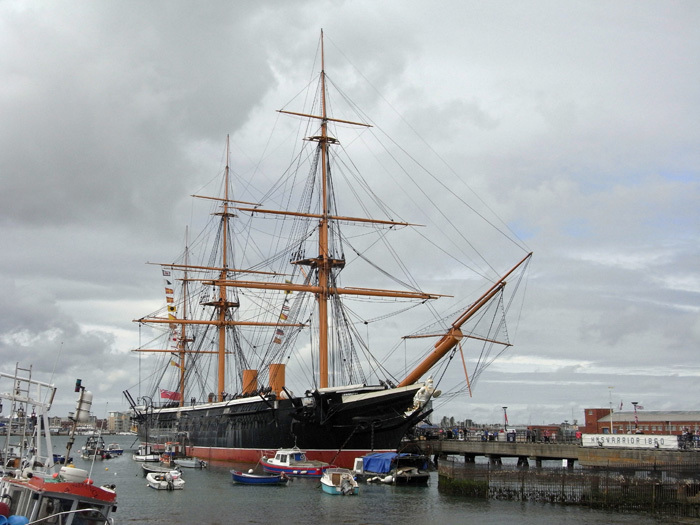 She was built in 1860, the Royal Navy’s first iron-clad warship, and is now part of the Portsmouth Historic Dockyards complex. 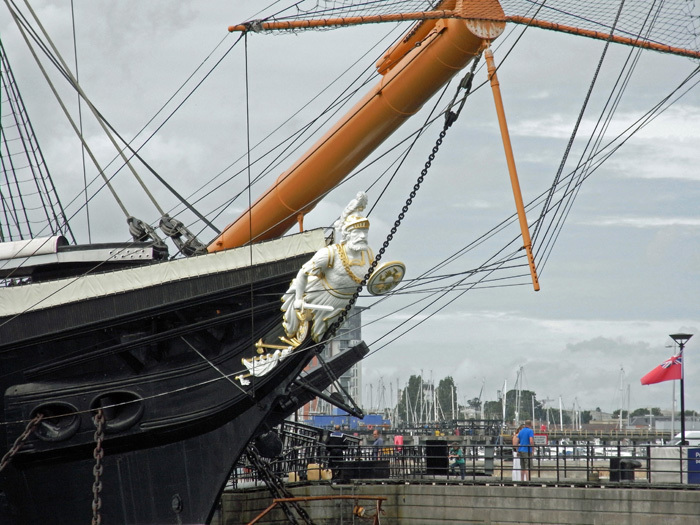 Her figurehead is rather fine as well. There’s more information on Warrior HERE, and the Historic Dockyards – home of Nelson’s HMS Vistory and Henry the Eighth’s Mary Rose HERE. 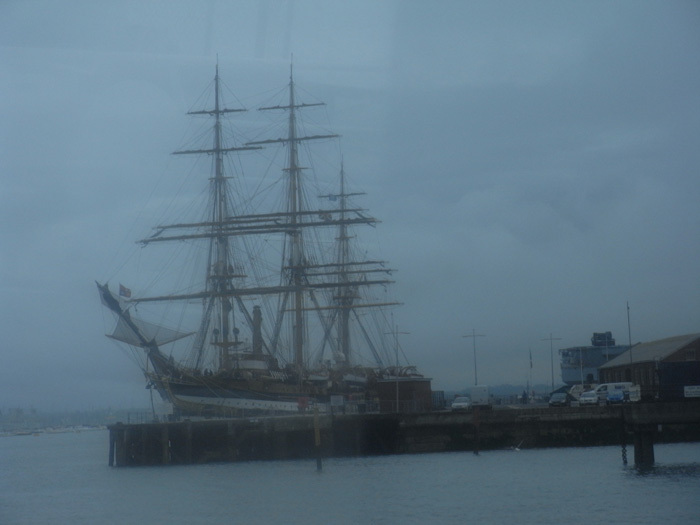 One day I’ll treat myself to a visit to the Dockyards. I haven’t been there since I was a child. Isle of Wight and Seahaven, I will be back. The Art Department at Silver Publishing is a hive of talent. 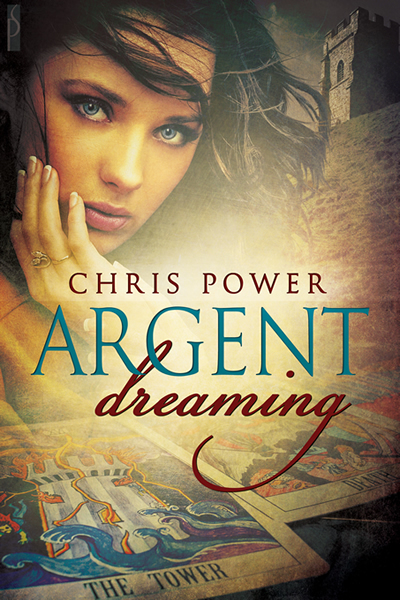 The award-winning Reese Dante had created the perfect cover for my paranormal mystery romance, Argent Dreaming and I couldn’t be more thrilled with it. The novel is due for release on September 22nd, and I’m finding it hard to wait *g*. 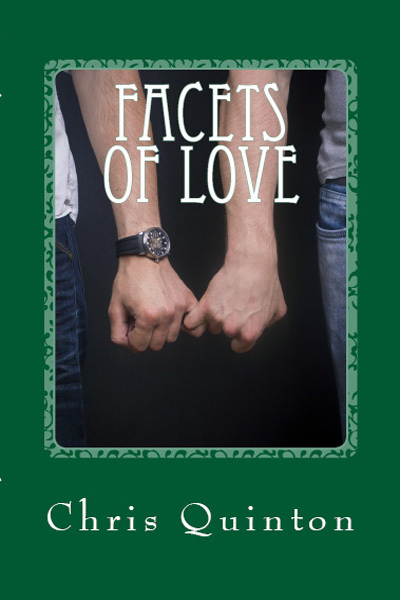 When the final edits have been done, I’ll post an excerpt. Caitlin has issues with Glastonbury, the town at the heart of what once was the Vale of Avalon. The power living there awoke her talents, but the experience terrified her and she has blocked them. Five years on, she returns to Glastonbury. 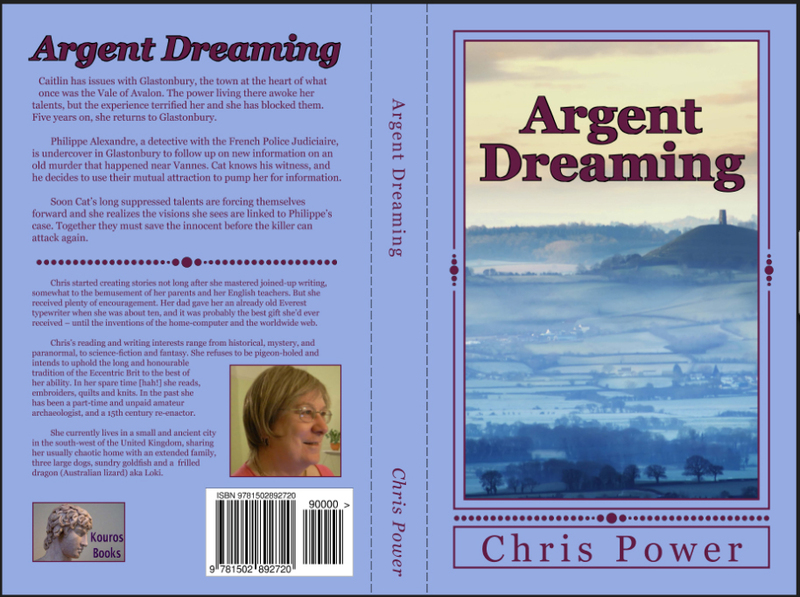 Philippe Alexandre, a detective with the French Police Judiciaire, is undercover in Glastonbury to follow up on new information on an old murder that happened near Vannes. Cat knows his witness, and he decides to use their mutual attraction to pump her for information. Soon Cat’s long suppressed talents are forcing themselves forward and she realizes the visions she sees are linked to Philippe’s case. Together they must save the innocent before the killer can attack again.